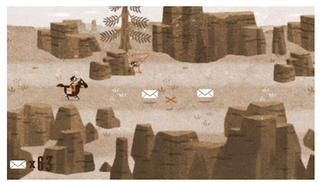 The latest Google Doodle video game celebrates the 155th anniversary of the Pony Express. You ride across America, collecting letters. To play, click the Google logo at google.com. It’ll take you about a minute. More back-story about the Pony Express and the five developers who made the game here.